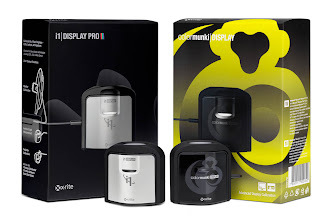 X-Rite has just announced two new monitor calibration products called the i1Display Pro and the ColorMunki Display. i1Display Pro is geared for those who want pro-level functions and control, and ColorMunki towards those who want easy of use. The i1Display Pro uses i1Profiler software, and Color Munki Display uses ColorMunki software. Based on CHROMiX tests of the i1Display Pro, the results are very good (especially compared to the i1Display 2 product). Expect a review in the near future from CHROMiX. Both i1Display Pro and ColorMunki Display products should be a welcome new addition to the market. Both are based on a new colorimeter device with a new optical system and with a new filtering technology. Both have a new, intelligent and innovative form factor. Main features included for both products are emissive measurement, ambient light measurement and sensing controls, flare compensation, iterative profiling, and automatic display control (ADC). The i1Display Pro is faster (5x) than the ColorMunki Display and the i1Display2 and includes a Display Quality Assurance verification, and a Display Uniformity Test. CHROMiX beta-tested the i1Display Pro for X-Rite and found it to be a superb product, especially for the price point. We're not sure yet about ship date, but expect August 2011. The i1Display Pro is expected to be street priced around ~$250 and the ColorMunki Display around ~$175. CHROMiX will be selling both units at competitive prices. And until September 30, 2011... you can trade in an old device and receive up to $40 for an i1Display Pro and $25 for a ColorMunki Display. Happy to see that X-Rite finally is responding to the all the critique that was aimed at the i1Display. If it wasn't matched to the specific monitor it often gave inferior results when used to profile a large gamut monitor. Have you had a chance to compare the i1DisplayPro to Basiccolor Discus? Yes, this is just what X-Rite needed to do: Come out with a newer instrument than the i1D2 that can deal well with the modern display. I have not had a chance to compare this to the DISCUS yet. I'm eager to try that when I get a chance.